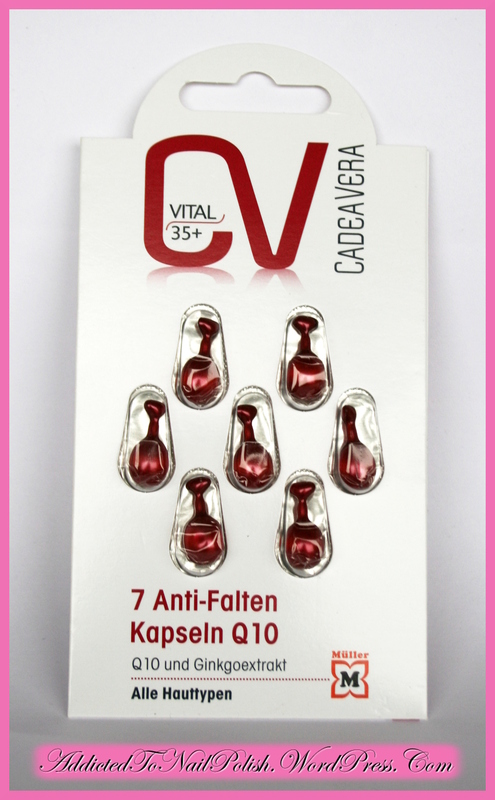 Review: CadeaVera anti-wrinkle Q10 capsules! Finally! I tested these two/three weeks ago and couldn’t wait to give you my review. These capsules just didn’t turn out to be the thing I’d like. I bought them in Mueller. Using the capsules: there’s quite some quantity of the product in one capsule – it really is enough (and more) for a whole face, neck & decolette massage! It’s a transparent silicone gel that needs a lot of time to sink into your skin (an hour? ), so I recommend doing this in the evening when already in your pajamas. 😉 This gel gives such a greasy feeling on the skin that I truly feared for my impurities to get worse! 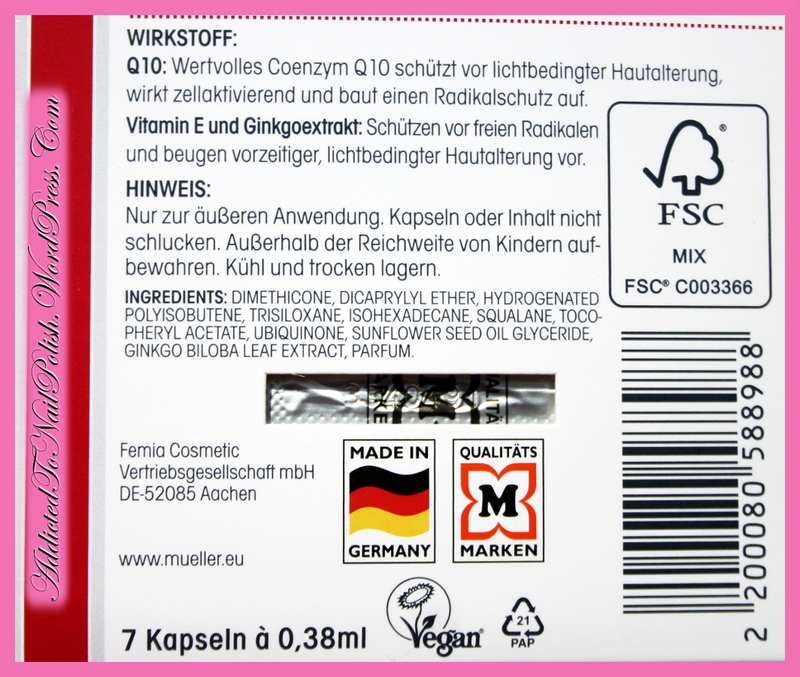 Because of so much product in one capsule there was always some excess product staying on my hands – I just massaged it into my cuticles, worked wonders! I noticed that after 3 days of using these capsules my skin became a bit water-repellent, this was so funny to see but on the other hand sad to experience! I had a feeling like my skin is being enbalmed with silicones and not letting anything out and neither anything in. A spooky feeling it is. On the third day I got a feeling that my skin is not hydrated enough beneath this siliconed film and I put some hydrating cream over, but that didn’t help. 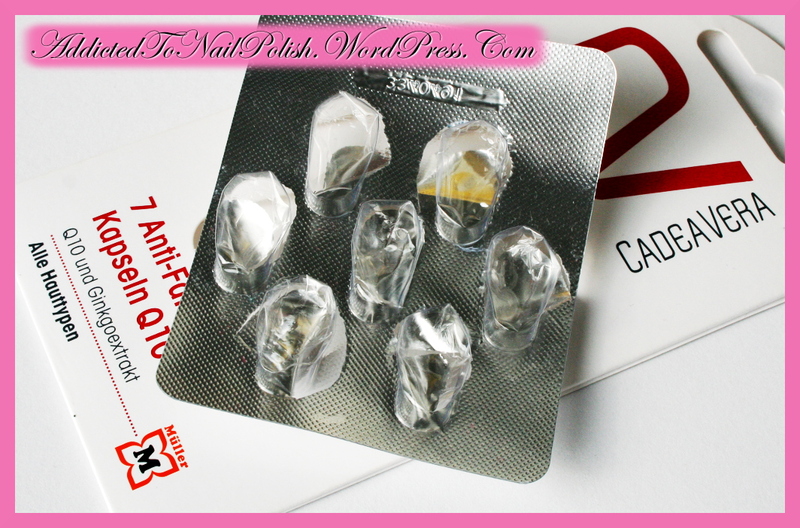 Using a lot of tonic water right before spreading these capsules on your face is a must! 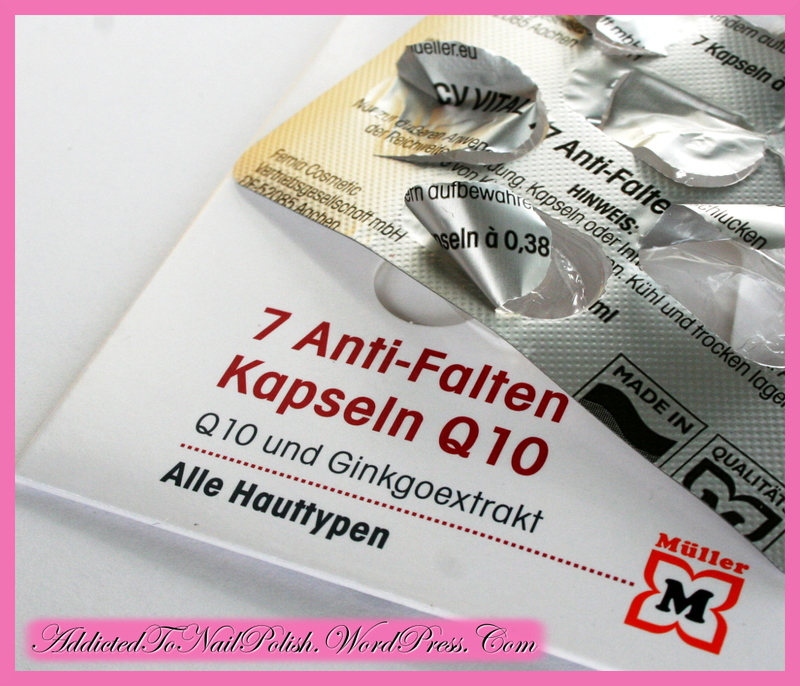 After the anti-age Q10 capsules therapy: my skin really became a tad softer, maybe even evened out, my wrinkles became a micrometer smaller let’s say! My skin became water-repellent for a week, and in this period my impurities started to build up under the skin. This horror with impurities might also be the result of antibiotic treatment and not just capsules! My skin became also a bit greasier than before, but it wasn’t alarming (it was greasy to touch, not to the eyes). All in all? I don’t see myself using these capsules in a short time in the future. I’m not even sure I’ll buy them again. But never say never. 😉 From my point of view, there was too little effect for so much fuss (especially the greasiness of the product and impermeability of the skin!). Maybe the anti-aging effect would show itself when using this long-term, I don’t know. I certainly wasn’t ready to give it another go right after the first treatment, because I had some skin problems incoming and had to deal with them. That’s it, my ladies! 🙂 If you have any additional questions, please leave them below so I can get back to you ASAP! 😉 Did you already try these capsules yourself? How did you like them? ← New in: Beauty Women nail polishes!